Will you just look at this sweet family? They were so fun to photograph. Together we wandered around Alex Robertson Park in Pickering. Little Melanie was a little bundle of energy. And hilarious to boot. She chased the bubbles with reckless abandon and was fascinated by the bullrush fluffs. Plus check out her grumpy little face. 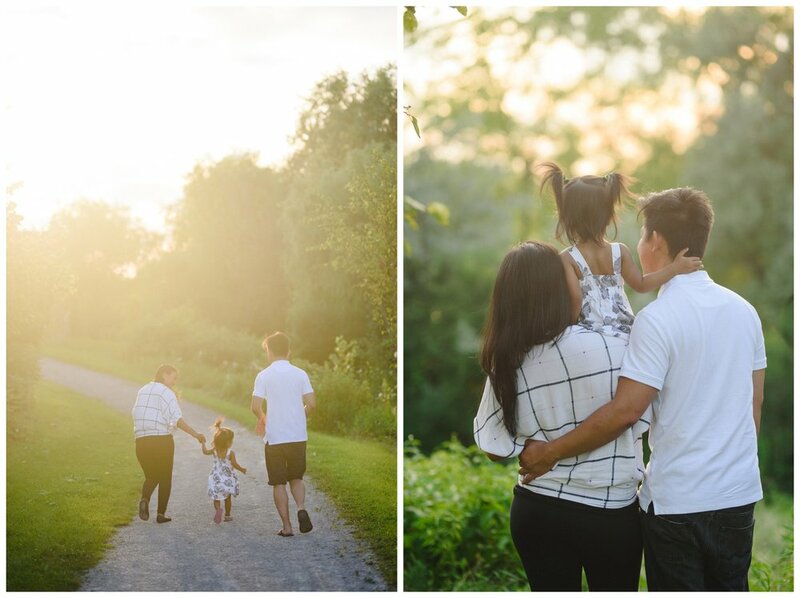 I love photographing families because it freezes a moment in time that you can keep forever. Littles won't stay little forever but the images of her laughter and their love will. That is a beautiful thing. Oh be still my heart! There is just something so mesmerizing about watching a new family. Capturing newborns in a relaxed and stress free way allows for just the cutest little expressions! Little Oakland was wide awake during our entire session. I mean completely awake, not even a yawn. Although he did seem perplexed by the entire situation his baby blues could melt everyone's heart. Not once did he cry. I was able to hang out with Amanda, Ben and Oakland in their adorable home observing and capturing them together as a new family of three.